Southwest corner of the family room on a virtual winter morning. December 2016 — With concrete work on hold until Spring, we have more time to get the interior details figured out. Mark had the floor plans wrapped up months ago and the only real change since then has been to replace the gas stove with a Jotul New Harbor gas fireplace. But when I put the fireplace in the corner of the living room where the stove had been, it looked wrong. Putting it on the wall under the high windows worked better. Since the firebox requires at least 16" of depth, that suggested flanking shelves and cabinetry. And because the chimney only had to go up eight feet or so to where the vent pipes go through the wall, that suggested capping everything with a big soffit. Which in turn produced an ideal space for recessed lighting, with the added benefit of a high shelf to display Large Interesting Objects of Questionable Utility. So, one relatively small change triggered off a series of design decisions that firmly established the big room's character, at least in our virtual world of Sketchup Pro, Google's 3D design program. The house has an open floor plan, so materials and colors used here need to harmonize with those in the kitchen and dining areas. Designing those spaces is easier now that we've set the tone and palette. In this process of assimilating all the potentials and then reducing them to a few simple directives, we develop a plan for fitting out the entire interior. The house is located on former farmland, and its exterior design echoes the lines and colors of New England barns and farm houses. The mandate for inside was to keep it simple and light, with a focus on white, black iron, natural wood, and stone. The insulated concrete floor is a smooth rich grey, and the massive trusses holding up the roof are solid Douglas Fir from Vermont Timber Frames, naturally finished with oil. All these elements combine gracefully and authentically to create a home that we dubbed "The New American Barn." It's a long way from 15th century Japan to rural Connecticut, but the values of honest material, timeless craftsmanship and simple beauty travel well. Which brings us to Wabi-Sabi. While there is no precise translation of this delightful Japanese term, it is used to express a design ethos focused on simple, natural and earthy elements, and "the Art of Imperfection" as exquisitely explained by Robyn Griggs Lawrence. In this aesthetic view, the authenticity of materials is a guiding force, the essence of materials defines their utility, and the beauty of materials grows as they naturally age. Wabi-Sabi came about in 15th century Japan as a visceral reaction to the ornate and gilded finery of the Imperial Court, and has remained a common thread in Japanese culture since then. Not too surprisingly, it is also in tune with the sensible building approaches of The New American Barn. revolutionize this classic construction material. For most people in our part of New England, the term "concrete house" conjures dank Colonial basements, small cinderblock homes or apartment complexes. Wood has always been the favored family home construction material here, mostly because we have access to lots of it, but also because of our long woodworking heritage. Since the 1600's, shipbuilders, carpenters and cabinetmakers from England and Europe thrived in this new land of virgin forest, and some of the grander homes built over the centuries are still around. Travel back some 8,500 years, to the treeless terrain of what is now Syria and Jordan. The ancient Nabataeans (Bedouins) were using another material to build with — a waterproof concrete with which they lined underground water cisterns and mortared rough stone buildings. The Greeks elevated the process and the recipes for cement and concrete, and the Romans perfected them in roads, aqueducts, bridges, huts, houses and monumental buildings like the 1,890-year-old Pantheon, which is crowned with what is still the world's largest unsupported concrete dome. Concrete in various forms was also employed by the Chinese and Egyptians from about 3,000 BC. Concrete was born in places that have natural resources of Lime (calcium oxide,) Limestone, sand and rock. A versatile material, it reached its modern form in the mid 1800's with the development of Portland Cement in England. Cement is the glue that holds concrete — a variable recipe of stone, sand, minerals — together. Portland's main ingredient is hydraulic calcium oxide or Lime, which has the unique ability to harden when exposed to water and create a waterproof product. Continuous experimentation with the processes and mixes over the decades gave us concrete as we know it today — the most versatile, widely used construction material on the planet. Modern concrete has been called "catnip for architects" because there's hardly a limit to the shapes and forms it can take. It's fun to design with. It's also immensely strong, does not warp, shrink or expand, is impervious to water, rot, insects and fire, and properly engineered can last for thousands of years. Yet there is one huge benefit to concrete that sometimes gets overlooked, even by architects and builders — its thermal mass. Thermal mass is essentially the ability of a material to absorb and store heat energy. Dense materials like concrete have a higher thermal mass than less dense ones like wood. Concrete can slowly warm in the sun and radiate that stored heat after the sun's gone. This is part of the essence of Passive House design, and getting these thermodynamics to work in harmony with a home heating and cooling system is a major part of the realsmarthouse project. It is also where a company named Thermomass™ comes in. Thermomass is a closed cell insulation system placed between two layers of concrete, connected by structurally designed composite fiber connectors that do not create heat-losing thermal bridges between the concrete layers. The system utilizes the thermal mass of concrete: inside heating and cooling is absorbed into the inner layer of concrete, kept from escaping by the closed cell insulation and returned to the inside of the structure. Outside heat and cold are kept out the same way; once the heat or cold reaches the closed cell insulation it is blocked from entering the structure. The closed cell insulation for realsmarthouse #1 is extruded polystyrene foam, or XPS, that also has an extremely high resistance to vapor transmission, which is good because moist air is harder to heat and cool. So, with a Thermomass structure, the bottom line is what's inside stays inside and what's outside stays outside. Structures built utilizing Thermomass Systems are extremely energy efficient. Thermomass was founded in 1980 by Robert T. Long in Cedar Rapids, Iowa. Widely employed in large scale commercial and industrial construction, Thermomass insulation systems are also an ideal solution for the residential construction market. In fact, one contractor in Connecticut, Dennis Purinton, saw the benefits of Thermomass in 2002 and realized that the product and the process had a good deal to offer home builders. Fourteen years later, Purinton Builders is one of five Connecticut Thermomass contractors, and through sister company New England Concrete Supply delivers Thermomass components throughout the region. Our first interview with Dennis back in July was an educational experience, not to mention a long one. Dennis walked us through an impressive portfolio of projects and detailed reviews of the Thermomass process and system, asking all the right questions about realsmarthouse, and even improving the wall design plans on the spot. While I tried to trip him up with questions like "Who built the first concrete house in America?" (Thomas Edison,) Dennis was always a step ahead. Wrapping up the meeting outside with plans and drawing pads on the hood of his truck, I learned he was also president of the national Concrete Foundations Association in Iowa, a big supporter of Habitat for Humanity, and ran both businesses with his wife Gayl and son Mike. Plus he loved his job. That became apparent when he and Mike showed up at the site and got to work. Peter O'Keefe had just finished the site prep and dug out for the footings when they started, and in the space of five days the footings and frost walls were done and ready for stone and drains. That would have been fast for a crew of four, but Dennis and Mike did it alone with tightly coordinated six truck deliveries from Tilcon Connecticut. Now entering the third week of October, the race is on to get the walls up and roof in. As they say on Game of Thrones, winter is coming... but with Thermomass walls, we'll be ready for it. Left to right: PortaPotty, PortaOffice, driveway, pickup and silt fence, Pete's Pyramids, Excavator and 1200 pink cubic feet of XPS insulation for the Thermomass walls. Labor Day, September 5th — For most people it's a holiday, but HJ O'Keefe Builders took delivery of their 8-ton excavator on site this morning, delivered by Mad River Construction of Westerly RI. With winter on the horizon there's not a lot of time to waste getting the shell up and covered. Peter O'Keefe hit the dirt with the excavator Tuesday morning, and by the following week — now — we are ready for the foundation pours. And the week before, a huge flatbed backed in over the lot to deposit 1200 cubic feet of 4" thick sheets of XPS, the extruded polystyrene foam that will form the middle of the Thermomass concrete sandwich walls. Site prep is a big deal, and when you are building solar you have to look at the compass as much as the dirt. Gregg Fedus of Fedus Engineering placed the foundation lines to true Solar South (14° 6' West magnetic deviation here), and the O'Keefe brothers nailed the lines down before digging in. Result: we are ready for the concrete. Next blog is all about the pour as Dennis Purinton of Purinton Builders oversees one of the few Thermomass homes to be built in this part of the country. Stay tuned for the fun stuff as we post. August 2016 — During the last three months of project specifying, RFP writing and subcontractor interviews, I occasionally ran across the term "hybrid home" while researching online. Most sources used the term to identify a house that blends two material technologies, like post and beam timber framing with Structural Insulated Panels — an ancient technique paired with a fairly recent innovation. It's a nice marriage of beautiful wood engineering, superior insulation and efficient construction methods. Carpenters like it because classic timber framing is a venerable craft, and that balances out the prefab feel of the SIPs. At the end of the job, you see the gorgeous, functional woodwork, and the SIPs have magically disappeared to form walls and ceilings. You might wonder as I did: If Hybrid Cars represent the the transition from fossil fuels to purely electric transportation, do Hybrid Homes like this represent a transition to a newer form of building technology? Maybe, but "hybrid" is not necessarily a binary equation. Many components and materials go into a car that has a gas motor and electric drive train, and these are constantly being evaluated and improved. Building houses is a bit different, but they too require multiple components and materials. The Real American Dream Home Company, an operation we like in Bennington VT, builds with timber frame and SIPs, plus stone, corrugated and structural steel, concrete, shakes and wood sidings. Each material has its place on the spectrum of form and function. The products that have real longterm value are the ones that tend to stick around, which is why the ancient art of timber frame construction will be with us for as long as there are trees. Hopefully that will be a long time... A friend visiting Shanghai related to me not long ago how, when checking into her hotel, the receptionist asked, wide eyed, is it true that in America we build houses out of wood? In much of the world, concrete and stone rule because they are plentiful and relatively inexpensive, and wood is dear. Ultimately homes get built with whatever the market can provide. In the US, the markets (both commercial and residential) offer virtually everything a creative homebuilder could desire. So here we have the freedom to consider a wide array of materials and methods to build with, mix and match them based on performance and aesthetic criteria, and carefully engineer them into a home. For the realsmarthouse shell we are marrying industrial strength 14" thick Thermomass concrete sandwich walls with Vermont Timber Frames mortise & tenon roof trusses and SIPs from The Timberline Panel Company for the roof, exposed steel second floor joists by New Millenium supported by engineered Gluelam beams and posts, and highly efficient Pella-EFCO windows and doors. This house is indeed a hybrid — of commercial and residential materials and methods. But the end result will be a beautifully livable and exquisitely comfortable home, whose value is also measured in longterm durability and savings in energy and maintenance costs. Is Hybrid the new future? It's certainly a prolific word. We specified a State Hybrid electric heat pump water heater for its efficiency. The garage will be wired for charging a Hybrid vehicle or fully electric people mover. My next dog may be a hybrid Alaskan Shepherd. Bottom line: If Hybrid means you have more choices, what's not to like? MARCH 2016 — Winter is coming to an end, and we're finally looking at shovel time! John's been hammering out the build schedule in Smartsheet, Mark got 90% of the construction plans done before his annual student Architecture Abroad trip, we've interviewed for the critical concrete contracting, and I am realizing that I'm not, totally not, an interior designer. We promised that we would make EVERY MISTAKE POSSIBLE on screen and paper before committing to material and labor, and that's what is happening. Who knew there were so many mistakes to make? But it's all good. Being able to make mistakes on your own spare time (and your own computer) is great. And the more you make, the more you explore the options to get around them, and that leads to new insights and avenues. Mark and I threw only one kitchen layout back and forth (he's the AIA CAD architecture and engineering guy, I'm the Sketchup Pro dude,) but we nailed it. My happy-dance moment — busting through Mark's kitchen wall under the cabinets to make a tunnel to the laundry room, inside which will live two 5' deep, ball-bearing-castered, pull-out pantry cabinets. Would they be ADA-compliant with an auto-open feature? More importantly, would they work as advertised? As my engineering design daughter #2 would put it, "We'll see." The interior is always a challenge, and starting with the kitchen raises the bar for the rest of the house. Every square and cubic foot gets analyzed for potential. Plumbing runs (the length of water pipes) are designed to be short as possible for energy management. Lighting (LED) is specified all the way from the kickspaces under counters to the under-cabinets to the highest (28' peak) ceilings, with their own controllers. ADA compliance for people with disabilities is designed in from the beginning, and suddenly ergonomics — the physical detail of how a space is used and interacts with people — becomes part of the process. How will that kitchen floor feel? Can you spin a wheelchair between the work areas? How does that kitchen cabinet move? Can I see what's in it without going in there? How do the dishes travel from dishwasher to storage? Suppose the oven door opened like a gate? Thanks to Karen O'Keefe, Sarah Janssens, and John O'Keefe (our new CM) for making the land happen. Stay tuned as we work the lot over the next few months, generate plan updates and get ready to bust dirt in April. Then the lawyers showed up. To make a long story short, an adjacent landowner decided to sue P&Z and "our" lot's current owner for allowing it to be subdivided, claiming that the town's land records are wrong, the commission acted improperly, etc. The folks involved on our side of the dispute are confident the madness will subside and the issues resolved favorably in perhaps eight months, minimum. This was disheartening enough to send me out on Zillow again, looking for other land to build on. Frustration can be energizing — in three crazy days I found a small lot in town, researched and conceptualized a realsmarthouse for its FEMA VE area (high-velocity maximum flood hurricane zone,) had the specs and drawings reviewed by the zoning enforcement officer, and — certainly not for the first time — deeply questioned my sanity. Well, it has been a long winter. Expanding access to lending and reducing financing costs can help buyers and developers of affordable housing. Part of the realsmarthouse ethos has always been to find the least expensive ways to build the most efficient and durable homes, whether luxury or affordable housing, and make them look and perform beautifully. The scalable commercial building systems we employ work for virtually any size or configuration of dwelling. "Efficiencies in operations and maintenance" are passive house gospel. Smart design and execution guide the whole process. So items 2 and 3 in the MGI report made me feel a bit better — in the big picture, we are certainly going in the right direction. #4 requires innovation at the financial and institutional level, which is outside of our scope. But clearly #1, land supply, is indeed the most critical. The fact that it's been difficult to find reasonably priced land in this neck of the woods just underscores its rarity in the rest of the world. When land to build on — to live, thrive and grow on — becomes hard to acquire, that is a real problem. Our example is just litigious neighbors, but you have to wonder if the planet's getting a bit crowded. On the upside, we now have more time to refine the plans and elevations for our prototype, which will be a variant of the New American Barn model. Have fun watching over our shoulders as this evolves, and if you'd like updates sent to you just sign up here. FEBRUARY 2015 — The human urge to refashion our environments is truly astonishing, yet so intrinsic to our cultures and histories we tend to take it for granted — especially from within our modern virtual cocoons where there's an app for almost everything. Yet despite that, appreciation of good, forward-thinking housing design and intelligent construction is growing in the US and much of the world. "Architects are leading a new revolution in sustainable design, driven by environmental, energy and social concerns. Realsmarthouse is part of this movement. We want to push it forward by enabling our contractors with tools they can use to grow their operations while they build smart housing." How we go about designing and building things says a lot about our cultures and attitudes. One of the fundamental driving forces behind advances in design/build methods, whether it's pyramids or polymers, is the evolution of technology, or finding better ways to manipulate materials and assemble them in new and better forms. We call it progress, and what really blows my mind is the aggregative effect of these learned technologies. Think about it — how many engineering advances have been realized since the invention of the wheel? Quite a few! How many have been lost or forgotten over the millennia? None of the useful ones that we know of. Absolutely none. Kurzweil's Law of Accelerating Returns defines this exponential change, but what does it mean for your house? Along with tech processes accumulated over time came the practitioners who refined them. New and more efficient (profitable) methods of farming and fishing, making, building and moving stuff helped drive new economies, and as specific processes were proven they became part of the social fabric. As long as they proved their value, these materials and processes became "the way things are done around here." Practitioners of proven technologies that made money had little incentive to innovate, at least until competition came along. But competition tended to come from within the same talent pool or industry, and as aggregated technologies drove specialization, those industries became more focused on doing "one thing well." This is in part why commercial building and residential building technologies grew in very different directions. Innovation in commercial building was and is driven by vast amounts of money, ego and business competition. Residential building was and is (mostly) driven by affordable mortgages, buyers' comfort zones, existing housing stock and a well-established set of trades. Subsequently, the aggregate of new technology in the commercial sector has grown exponentially since WWII, while that in the residential sector has for the most part remained quietly in tune with "the old ways" and engendered a mammoth home improvement and maintenance industry. Today, growing awareness of energy conservation, sustainability and "smart" housing choices are galvanizing the residential design/build sector in many parts of the US and the world. New products and techniques are changing the way we think about home building, and materials and technologies once the province of commercial construction are being adapted to home use innovative and exciting ways. We are proud to be a part of this evolution! DECEMBER 2014 — The real estate mantra "location, location, location" means a lot more than good schools and nice neighbors. As I've been reminded over the past 18 months of site hunting here in Connecticut, it's also about the dirt, trees, rocks, wetlands, sunlight, road frontage, acreage, drainage, well water, flood zones, utilities, property lines and all that stuff we tend to take for granted when the roof is already over our heads. Starting "from the ground up" is precisely that — dirt! Now consider that your house lives in the junction between the dirt and the atmosphere, and you'll realize just how much impact those global entities can have on your home. I'm not talking earthquakes and tornadoes here, just the daily business of ground, atmosphere and sun. Today (like many New Englanders this time of year) I'm thinking about sun. Because my day job is communications and marketing, realsmarthouse began two years ago with demographic research into "housing in America." What did most people need and want, now that the real estate bubble has long since burst and McMansions look foolish? First discovery stop: the Suburbs. I was delighted to learn that the term "suburb" has been in use since Roman times in one form or another to mean the exactly same thing. But as I delved into the evolution of housing in the hope of predicting its future, more questions than answers came bubbling up. Before long, I felt like Alice falling down the rabbit hole... or should I say, out the Vindauga. Vindauga is Old Norse for "wind hole" or "wind eye" and the precursor of "window." Back then it was a hole in the sod roof to let smoke out, and as wall-building technology developed, holes there too to let the breeze in and to shoot arrows out of. It wasn't until the late 1500's that window glazing became economically feasible for the merchant class, and that was a huge advance. Now you could close the vindauga to keep the rain and bugs out but let the light in, open it for the breeze or to shoot arrows out. This was a major technological advance in home building. "The window was also perhaps the last truly game-changing evolution in residential housing design, and a milestone in our retreat from living in the natural environment." Stone, wood and now glass became the defining elements of house building in the Western hemisphere, each with its own techniques, tools and tradesmen. These days, most of our stick-built houses still follow many centuries-old construction methods, though now, of course, you can buy your vindaugas double- or triple-glazed — and you can still open them to let the wind in or the arrows out. But because your house likely has a nice HVAC system and you are not a rabid Hunger Games fan, you rarely open those windows or shoot arrows out of them, and so you probably use the windows mostly for the view and the light. That's when Suburbia gave me a big WTF moment. Your typical house there, with the street out front and the neighbors left and right, has one decent view: the back yard. There are millions of beautiful back yards in America, but many millions more shades and blinds and curtains over windows to the left, right and front, because there's often nothing much to see there and besides, you really don't want your nosy neighbors looking in. But, you at least need the windows for the light, right? Well... let's think about that for a moment. Sunlight comes from the sky and reflects off the landscape around your home. Inside the house, it bounces off the walls and floors and furnishings, lighting up the rooms. 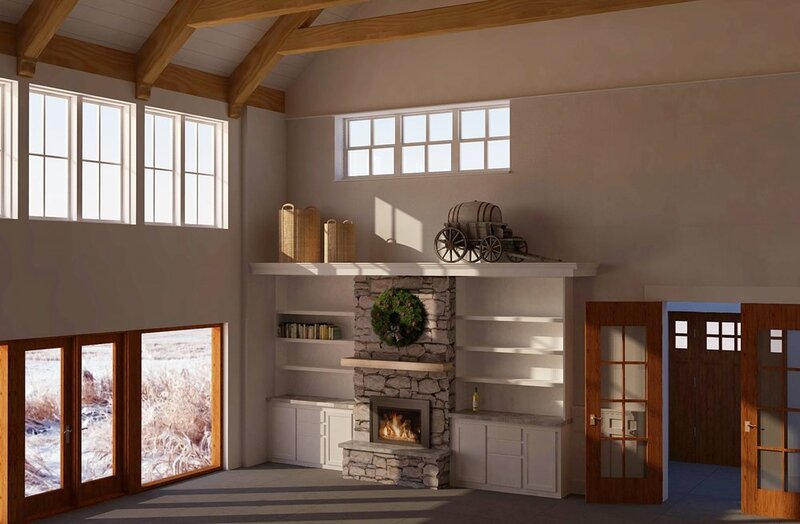 The sizing and placement of glazing in windows and doors around your home, especially in a tightly insulated, passive solar home, is critical. You want the best natural light from your location, but you don't want to lose energy through too much glass (even the latest triple pane windows achieve an R value of 5, compared to 10+ for an insulated wall.) That's why we spend a lot of time analyzing the light flow in realsmarthouse models, and researching such remarkable products as Kalwall nanogel panels. As of this writing we are most of the way to achieving the perfect balance of natural daylighting and energy savings for the New American Barn. Stay tuned! What's a real smart house? The term "smart house" was coined in 1984 by the National Association of Home Builders, giving a name to the pending digital evolution of our homes. That was also the year Motorola began selling the beige, brick-like DynaTAC, the world's first manufactured mobile phone, but a full a quarter century before NEST, the first commercially viable, well-designed "intelligent thermostat." What a difference 25 years makes! Now, 30+ years later, your phone can manage your thermostats, view your web cams, turn on the lights — and your house feels pretty darned smart. But ... "smart house" is a bit of a misnomer. Smart systems, yes, but in most cases these systems are being installed in houses that are fundamentally no smarter than they were 200 years ago, or more. That's why I decided to look at house design from the ground up, and find out what really is "smart" when it comes to building your home from scratch. "Realsmarthouse® is NOT about the "Internet of Things." Most people who hear "smart house" think of home automation, web-enabled appliances that can talk to your phone. Cool technology, but do you really need the fridge to text you if you're low on milk? Probably not. That's why we put the "real" in realsmarthouse." realsmarthouse® design, with its utilization of Passive House standards, is an integrative construction practice that takes a broad but focused look at the physical requirements, environmental situations and technological potentials of a home. The physical requirements are what you want in a home — types and number of rooms, amenities and appliances, finishes, furnishings, etc. The environmental situation is your site's attributes derived from the earth (insulation, thermal mass, anchorage) from the sky (solar energy and heating, daylighting, air, winds and precipitation) and other factors, such as view and landscape. The technological potential, which is evolving daily, is the studied adoption of energy, security and environmental systems. All systems considered by realsmarthouse are proven and established, and their connecting infrastructure is specifically designed to easily enable upgrades as technologies improve. "Future proof means creating a house where evolving technologies are easily accommodated. When you build a home that will last a very long time, having the option to rewire it 30 years on without tearing up the walls is a good thing." Most of the technological advances in construction in the USA have taken place in the commercial sector, where the impact of material and energy efficiencies is greatly magnified by the obvious requirements of having to economically manage many more people and equipment under one roof. The single family residential sector has not had that incentive, but with energy costs, environmental concerns and worries about serious weather events, there's plenty of incentive to build more intelligently. The realsmarthouse bottom line: longterm value for property owners. That is our goal. © 2019 realsmarthouse® LLC. All rights reserved.